I thought that the Quaker Breakfast Cookies were just okay. When I opened the package, the cookie was at first appealing as it was nice and soft and had a pleasant oat-ey aroma. They're perfectly chewy and have a good hearty texture. Unfortunately, they were missing the traditional "oatmeal cookie" flavor that we've grown to love. The chocolate didn't taste like genuine chocolate either. Worst - it left a chalky aftertaste in your mouth. I doubt I would buy these again. I liked these a little better than Kellie (Thanks Kellie for sending your review!). 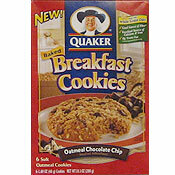 In 2004, I was very disappointed when Quaker started rolling out on-the-go breakfast baked goods. Back then, I reviewed their Oatmeal Breakfast Squares. It read, "...the worst product in the breakfast bar category that I've ever tasted." Thankfully, they've made improvements since then. To me, the cookie tastes pretty good. If I were to have made a similar cookie in my kitchen, I'd be pretty pleased with myself. There are pieces of chocolate in every bite and the texture is chewy and moist with intermittent flurries of light nutty oat crunch. I might understand what Kellie is saying about an aftertaste, but I have to concentrate and look for it to notice it. If your eye is on health, fix your focus on the nutrition panel. At 180 calories per cookie (with 2 grams of saturated fat), it's important to note that a cookie under any other name is still a cookie. 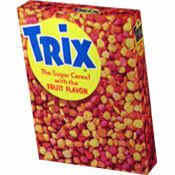 There's a smattering vitamins and minerals, but no more than you'd get from a bowl of nearly any cereal. The 4 grams of fiber per serving is respectable but nothing to jump up and scream about. Personally, I'm not crazy about the entire concept of breakfast bars (let alone breakfast cookies). They reduce the best meal of the day to a nutritional obstacle... a necessity to get out of the way. I like to take a little time in the morning and treat myself to a real meal... relax and plan my day. It's what makes me a pleasant and peaceful guy in the hours that follow. With that said, I will definitely welcome the rest of my box of breakfast cookies as an occasional afternoon snack. Kellie gave this product 3 Golden Eggs. I give it 5. The $2.50 price reflects a 10-ounce box containing 6 cookies. It was purchased as part of 2 for $5.00 sale. What do you think of Oatmeal Chocolate Chip Breakfast Cookies? I really enjoy the cookies for a breakfast on the run. Or afternoon snack. I think they taste great and my 14 year old daughter likes them too, a plus!! I think they're pretty good. The taste is good and they're soft and chewy. They taste bad including the chocolate chips. Just look at the small print "partially hydrogenated soy oil" and don even check on the sugar content of 1 cookie.